Nationality: American. Born: Elvis Aron Presley in Tupelo, Mississippi, 8 January 1935. Education: Attended L. C. Humes High School, Memphis, Tennessee, graduated 1953. Family: Married Priscilla Beaulieu, 1967 (divorced 1973), daughter: Lisa Marie. Career: Worked as truck driver; 1954—first recording: by 1956, the center of tremendous publicity based on his records and appearances on television and stage; 1956—contract with Hal Wallis: film debut in Love Me Tender , followed by a series of successful films until 1969; 1958–60—served in the U.S. Army in West Germany; returned to singing and moviemaking; occasional cabaret engagements. Died: In Memphis, 16 August 1977. Crumbaker, Marge, and Gabe Tucker, Up and Down with Elvis Presley , New York, 1981. Hawkins, Martin, and Colin Escott, Elvis: The Illustrated Discography , London, 1981. Hopkins, Jerry, Elvis: The Final Years , London, 1981. Rogale, Jean-Yves, Le Roi Elvis , Paris, 1981. Whisler, John, Elvis Presley—a Reference Guide and Discography , Metuchen, New Jersey, 1981. Sauers, Wendy, Elvis Presley: A Complete Reference , Jefferson, North Carolina, 1984. McLafferty, Gerry, Elvis in Hollywood: Celluloid Sell Out , New York, 1989. Schuster, Hal, The Films of Elvis Presley , Las Vegas, Nevada, 1989. Bartel, Pauline C., Reel Elvis: The Ultimate Trivia Guide to the King's Movies , Dallas, 1994. Esposito, Joe, Good Rockin' Tonight: Twenty Years on the Road and on the Town with Elvis , New York, 1994. Hazen, Cindy, The Best of Elvis: Recollections of a Great Humanitarian , New York, 1994. Stanley, David, The Elvis Encyclopedia , Los Angeles, 1994. Nash, Bruce M., Amazing but True Elvis Facts , Kansas City, Missouri, 1995. Carman, Wayne, Elvis's Karate Legacy: The Untold Story of Elvis Presley's Faith, Spirit & Discipline , Branson, 1998. Gould, Jay, Elvis 2000: The King Returns , London, 1999. Kirchberg, Connie, Elvis Presley, Richard Nixon & the American Dream , Jefferson, 1999. Opdyke, Steven, The Printed Elvis: The Complete Guide to Books About the King , Westport, 1999. Meltzer, R., "The Films of Elvis Presley," in Take One (Montreal), March 1974. Marill, Alvin H., in Films in Review (New York), December 1977. Braun, Eric, "Elvis: In Search of Satisfaction," in Films (London), September 1982. Barron, M., and F. Barron, "Elvis! A Personal View," in Hollywood: Then and Now , no. 8, 1992. Joyrich, L., "Elvisophilia: Knowledge Pleasure, and the Cult of Elvis," in Differences , no. 1, 1993. Hampton, Howard, "Elvis Dorado: The True Romance of Viva Las Vegas , in Film Comment (New York), July/August 1994. Norman, Barry, in Radio Times (London), 7 January 1995. Okuda, Ted, "Who Was That Masked Batgirl?" in Filmfax (Evanston), July-August 1995. Cambor, K., "The King Lives On," in Newsweek , 18 August 1997. Gates, D., "Good Rockin,"' in Newsweek , 18 August 1997. Schoemer, K., "Burning Love," in Newsweek , 18 August 1997. No major star suffered through more bad movies than Elvis Presley. Of the 31 he made in his decade-and-a-half as a movie star, arguably only Don Siegel's Flaming Star , in which he played Pacer, a half-breed torn between loyalty to his Kiowa mother and his white father and stepbrother—a nonsinging role for Presley—has any redeeming value beyond the star's appearance. That he continued to make films for 13 years is testament to the durability of his star quality. In 1956 Presley rose from obscurity to become a national figure as rock and roll's first superstar. Within months of his first national recording success Presley began making films; Love Me Tender , released before the year's end, recouped its $1 million cost in the first three days of release. a rock 'n' roll singer. Among the many great performance pieces is the finale, "Got a Lot of Living to Do," which features Elvis in a thigh-slapping, hip-shaking performance. In his next film, Jailhouse Rock , Elvis was shown at his singular rockin' best: as inmate Vince Everett, he leads his fellow prisoners through a volcanic, snarling rendition of the title song. This film, like Elvis's other early movies, allowed him to create a more well-rounded character than in his later efforts. The final scene where he faces the possibility of losing his voice and realizes the importance of his friends is touching. As with Loving You and Jailhouse Rock , Elvis's next film, King Creole , was a narrative about the complications of a rapid rise to stardom. Set in New Orleans, Presley played high school student Danny Fisher, an insolent punk who is "discovered" and becomes the toast of Bourbon Street. Similar to Loving You , King Creole contained autobiographical overtones: like Elvis, Danny Fisher's music was based in black culture—in the film's opening, Elvis and several black street vendors sing "Crawfish," while at the King Creole, Danny rocks in a Dixieland style with a call/response format. In Loving You , Presley had paid homage to his other major musical influence—country music—with his performance of "Lonesome Cowboy." Considering his substantial following, it is curious that he was continually saddled with mediocre scripts and second-rate directors, particularly after his 1960 return from Army service. It was as if Hollywood knew he would bring in the customers despite the narratives. Loyal fans continued to see his films and eventually contributed in excess of $180 million to the Hollywood coffers. In addition they gave gold status to nine soundtrack albums. While the early films featured Presley as a rock star, many of his 1960s vehicles had him in any number of improbable guises from which he broke into improbable song: as the rebellious Glen Tyler in Wild in the Country , he develops a relationship with a psychiatric counselor (Hope Lange) who encourages his flair for writing and arranges for him to receive a scholarship to college; as race car driver Lucky Jackson in Viva Las Vegas he uses his singing talents to woo a swimming instructor played by Ann-Margret; as American movie star Johnny Tyrone in Harum Scarum , he is kidnapped in the Middle East, escapes, and falls in love with Princess Shalimar (played by Miss America, Mary Ann Mobley). Of the 1960s films, Roustabout is arguably the most interesting. Here Elvis plays Charlie Rogers, an insolent, parentless entertainer who finds a new home with a carnival show operated by Barbara Stanwyck. His performances light up the midway and save the carnival from bankruptcy. The experience of working with the pop idol was a positive one for the screen veteran; as Stanwyck stated, "The idea of working with Mr. Presley intrigued me . . . . Mr. Wallis said he was a wonderful person to work with . . . and he is. His manners are impeccable, he is on time, he knows his lines, he asks for nothing outside of what any other actor or actress wants." Throughout the 1960s Presley avoided the concert and public appearance route, opting for visibility through films. By the end of the decade this strategy had begun to fail, neither movies nor records selling at previous high levels. With the failure of Change of Habit —with Mary Tyler Moore as a nun—Elvis stopped making films. No one seemed interested in Presley, who at the height of his film career was earning $1 million per movie plus a substantial percentage of the gross. 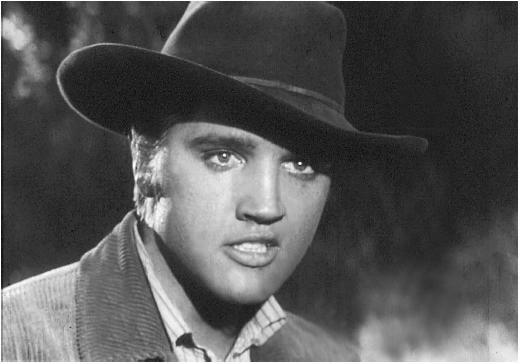 Presley was able to break out of the confines of his now-dated image by leaving the silver screen for the small screen. In a 1968 television special that combined the hokey musical numbers familiar from his movies with leather-clad, bare-bones rocking and rolling (in front of a live audience), Elvis reintroduced himself to the public. His career was reinvigorated, with a return to concert tours and rootsier, bluesier recordings (his records of the 1960s generally having consisted of substandard movie soundtrack songs, which bore little resemblance to his seminal 1950s rockabilly style). To capitalize on Presley's change of direction, a movie was again considered, but this time it was to be a documentary of an Elvis concert tour. Elvis, That's the Way It Is brought forth Presley's charisma and musical talent far better than the mundane, studio-concocted fluff he had been forced to wade through for the previous decade. In typical Presley fashion, however, once was not enough. Two years later Elvis on Tour gave us another look at "the King" on-and off-stage, but the magic was wearing thin for both Elvis and his audiences. It was to be Elvis's last movie. Presley's importance to film history is less for his continued popularity than for the trend he set within the musical genre. With the success of his vehicles, other recording stars were signed to movie roles and throughout the 1960s there continued a never-ending stream of jukebox musicals: minimal narratives with lots of hit tunes. In the first scene of his movie debut, Elvis was seen deep in the frame laboriously dragging a plow. In retrospect we can only marvel at how prophetic that shot was considering the material he was made to drag through movie theaters for the next 14 years.